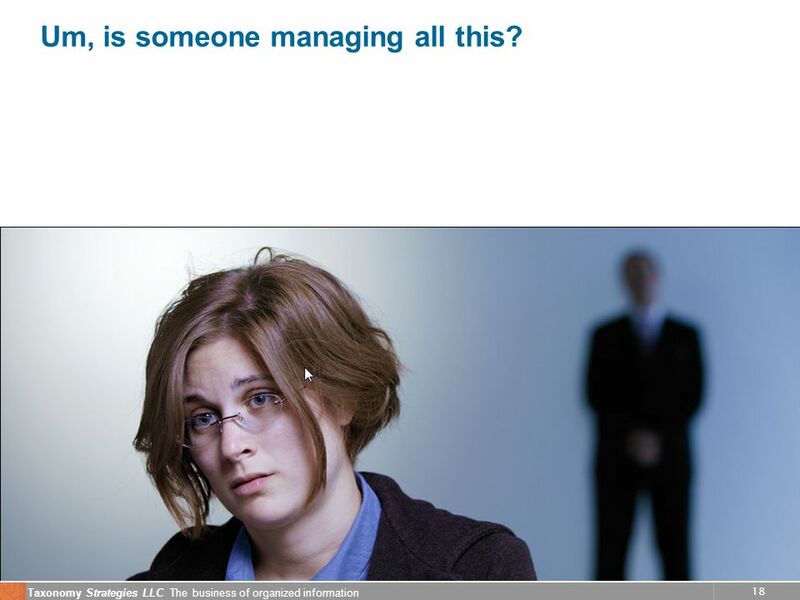 2 2 Taxonomy Strategies LLC The business of organized information Metadata and Taxonomy Metadata Title Author Department Audience Topic Topics Employee Services Compensation Retirement Insurance Further Education Finance and Budget Products and Services Support Services Infrastructure Supplies Each list is a controlled vocabulary. 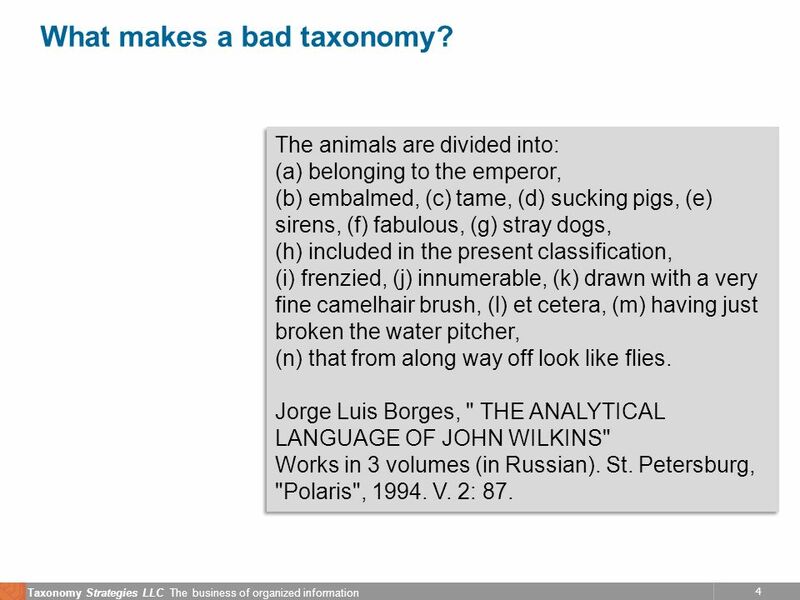 The Taxonomy is the set of all the controlled vocabularies. 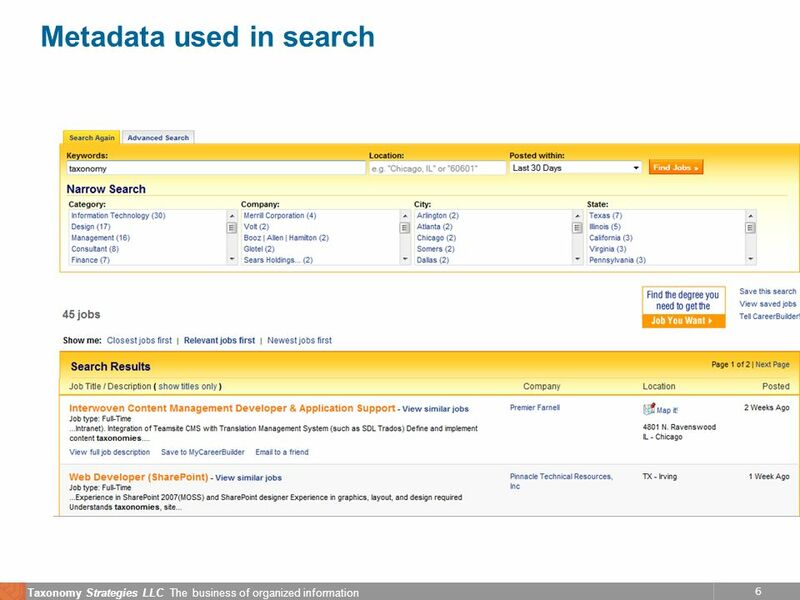 Audience Internal Executives Managers External Suppliers Customers Partners Metadata is data about data – in our case it is a set of fields of library catalog-like data about published content..
4 4 Taxonomy Strategies LLC The business of organized information What makes a bad taxonomy? The animals are divided into: (a) belonging to the emperor, (b) embalmed, (c) tame, (d) sucking pigs, (e) sirens, (f) fabulous, (g) stray dogs, (h) included in the present classification, (i) frenzied, (j) innumerable, (k) drawn with a very fine camelhair brush, (l) et cetera, (m) having just broken the water pitcher, (n) that from along way off look like flies. Jorge Luis Borges, " THE ANALYTICAL LANGUAGE OF JOHN WILKINS" Works in 3 volumes (in Russian). St. Petersburg, "Polaris", 1994. V. 2: 87. The animals are divided into: (a) belonging to the emperor, (b) embalmed, (c) tame, (d) sucking pigs, (e) sirens, (f) fabulous, (g) stray dogs, (h) included in the present classification, (i) frenzied, (j) innumerable, (k) drawn with a very fine camelhair brush, (l) et cetera, (m) having just broken the water pitcher, (n) that from along way off look like flies. Jorge Luis Borges, " THE ANALYTICAL LANGUAGE OF JOHN WILKINS" Works in 3 volumes (in Russian). St. Petersburg, "Polaris", 1994. V. 2: 87. 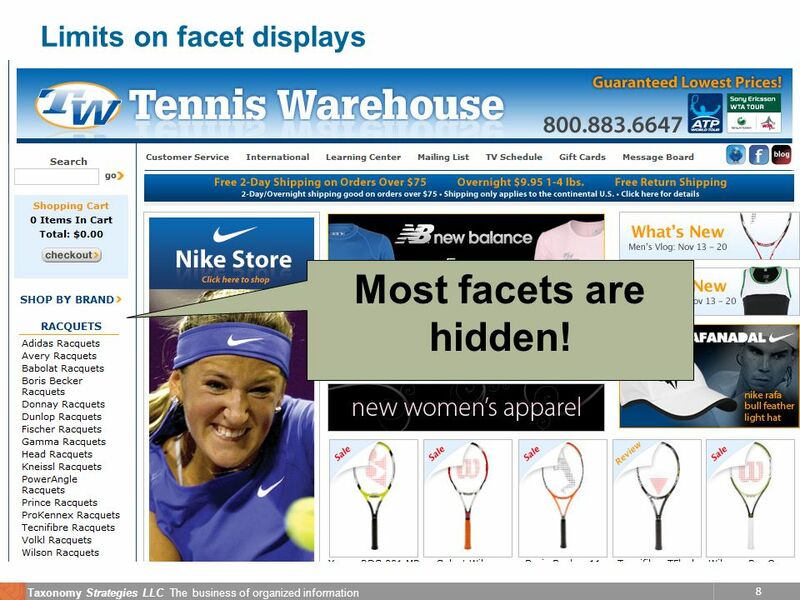 8 8 Taxonomy Strategies LLC The business of organized information Limits on facet displays Most facets are hidden! 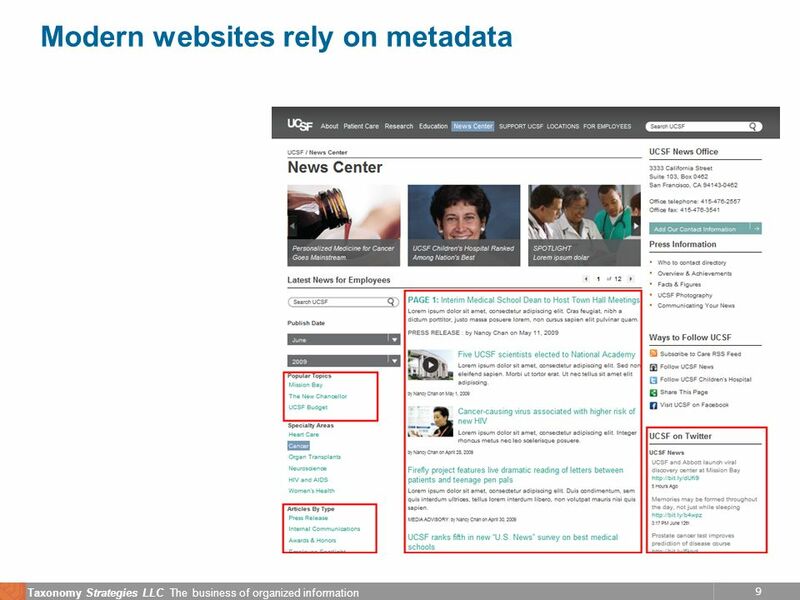 10 10 Taxonomy Strategies LLC The business of organized information Who decides what metadata is needed? 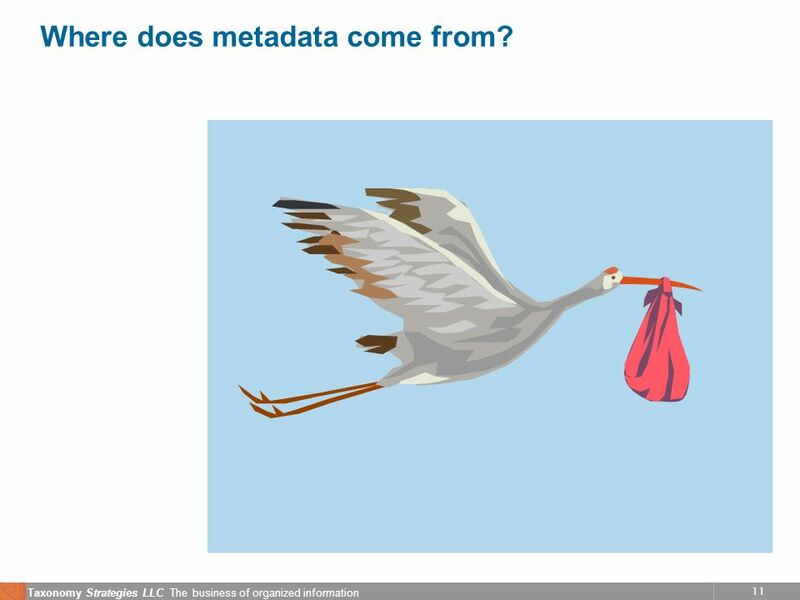 11 11 Taxonomy Strategies LLC The business of organized information Where does metadata come from? 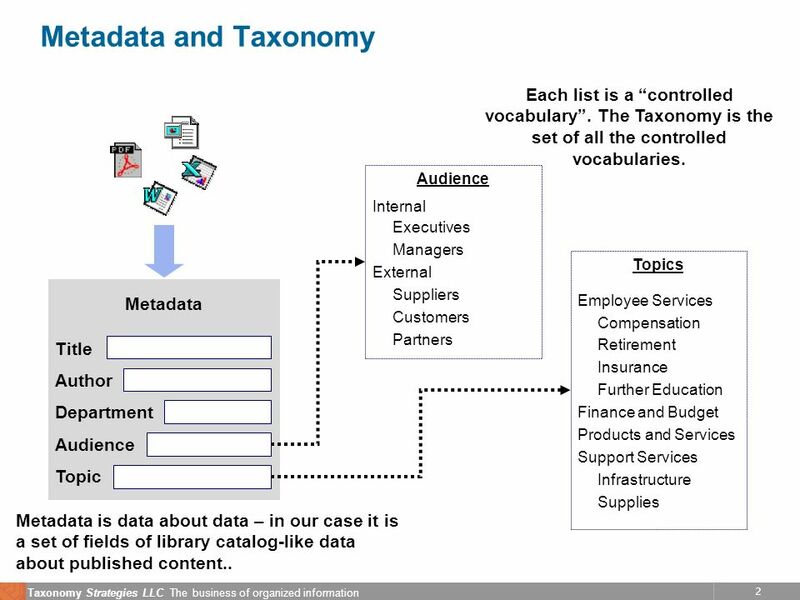 12 12 Taxonomy Strategies LLC The business of organized information What does it cost to create metadata? 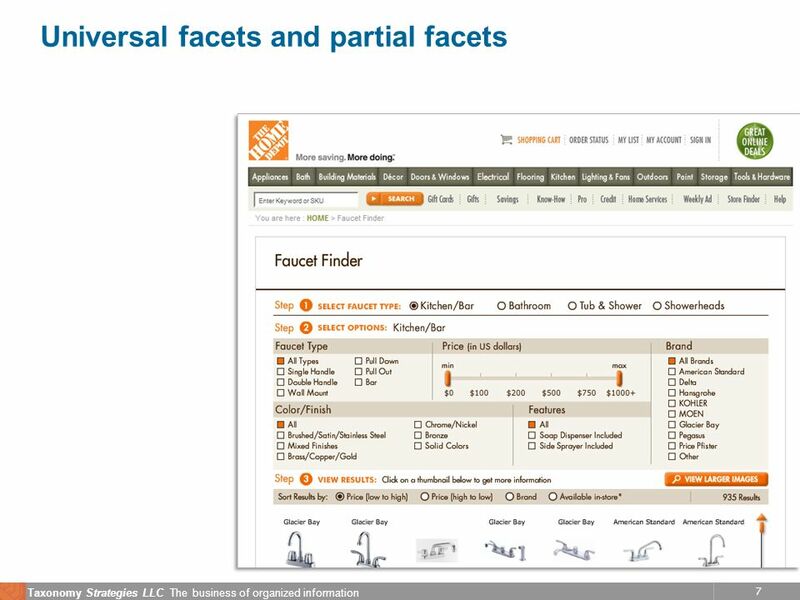 Taxonomy FacetHier? Typical CV Size Time/ Value (min) Avg # values / Item$ / Min Cost/ Element AudienceN100.252 $ 0.42 $ 0.21 Content TypeN200.251 $ 0.42 $ 0.11 Organizational UnitY90N//A1 N/A $ 0.42 Products & ServicesY5001.54 $ 0.42 $ 2.52 Geographic RegionY1000.52 $ 0.42 Broad TopicsY40024 $ 0.42 $ 3.36 TOTALS 1080515 $ 7.04 Inspired by: Ray Luoma, BAU Solutions Consider complexity of facet and ambiguity of content to estimate time per value. 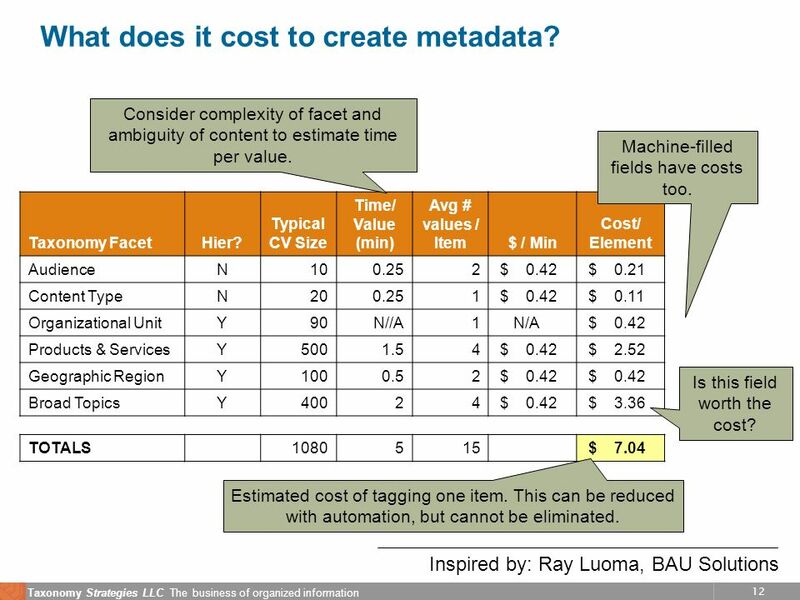 Estimated cost of tagging one item. This can be reduced with automation, but cannot be eliminated. Is this field worth the cost? Machine-filled fields have costs too. 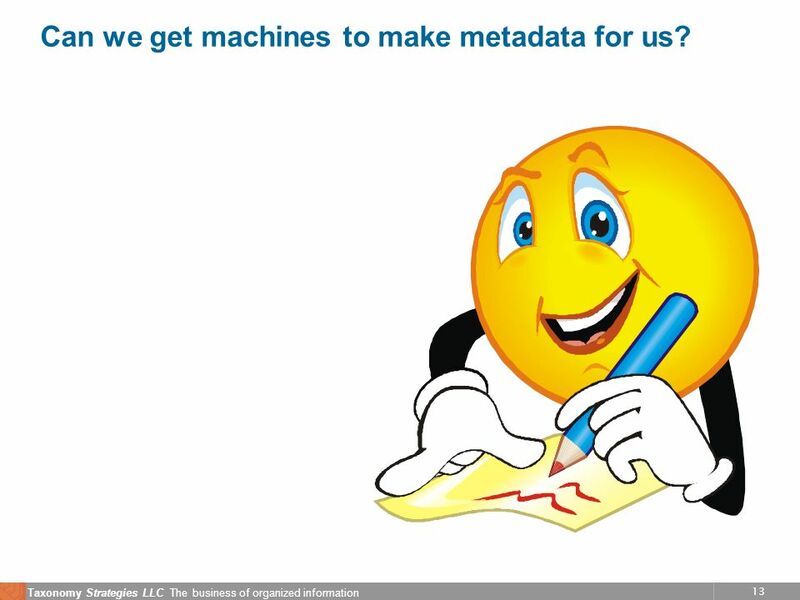 13 13 Taxonomy Strategies LLC The business of organized information Can we get machines to make metadata for us? 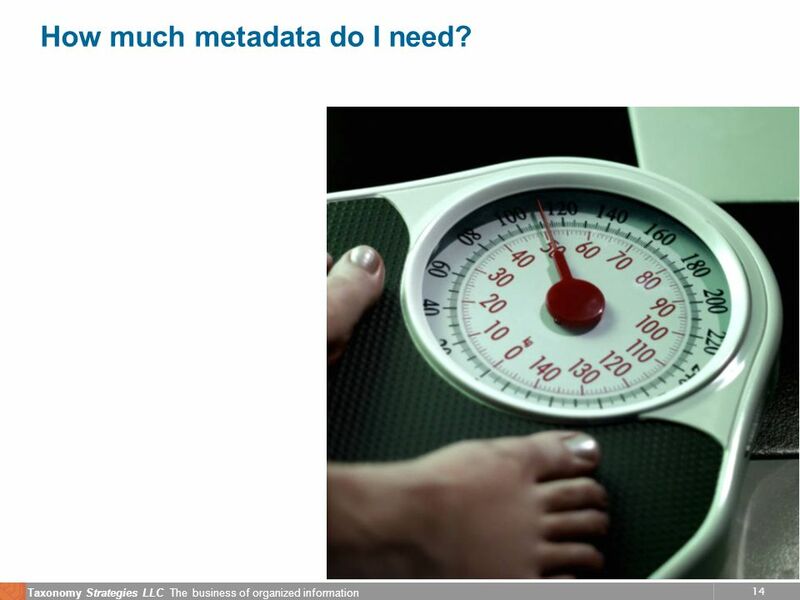 14 14 Taxonomy Strategies LLC The business of organized information How much metadata do I need? 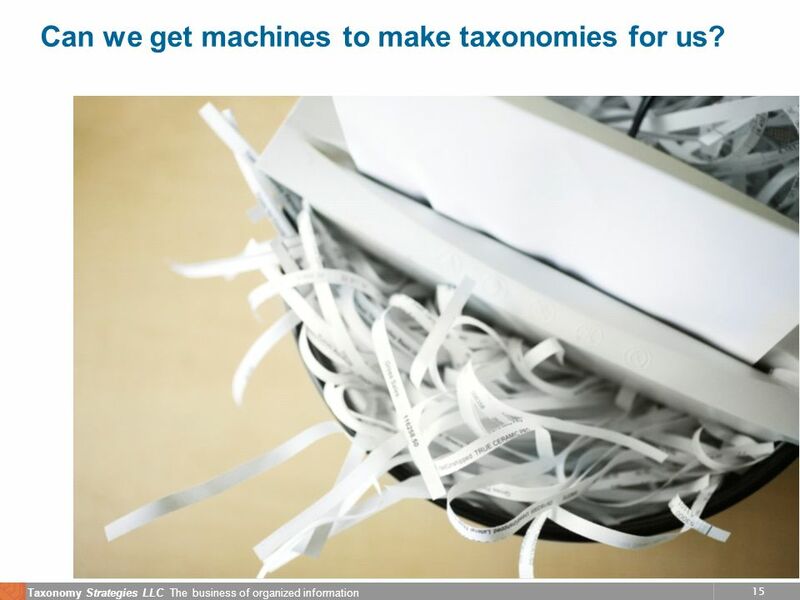 15 15 Taxonomy Strategies LLC The business of organized information Can we get machines to make taxonomies for us? 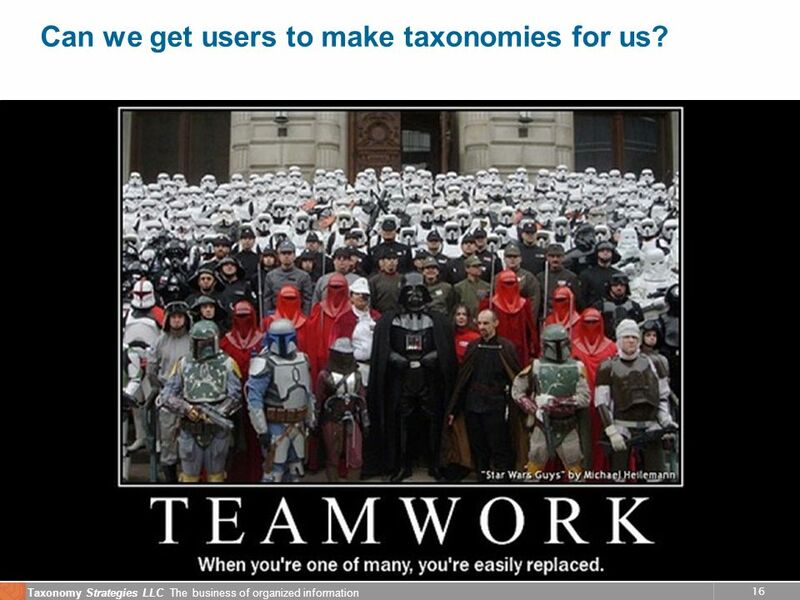 16 16 Taxonomy Strategies LLC The business of organized information Can we get users to make taxonomies for us? 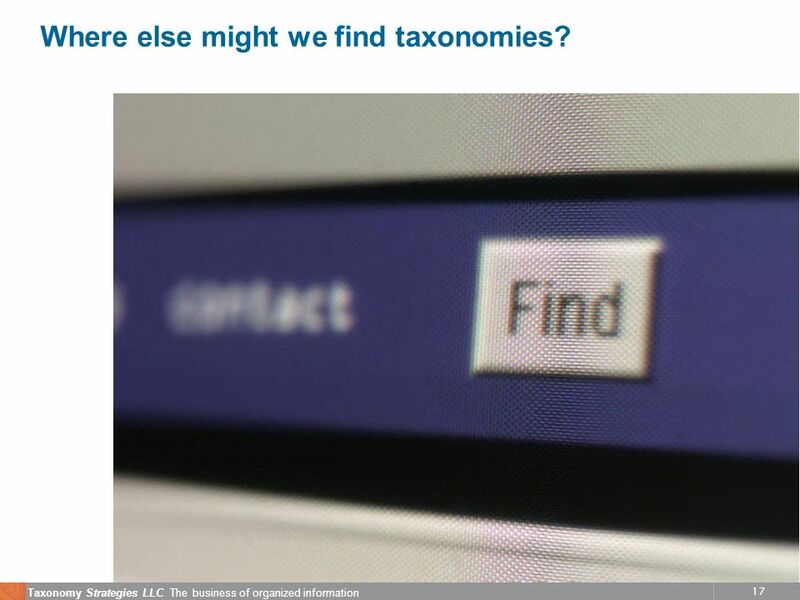 17 17 Taxonomy Strategies LLC The business of organized information Where else might we find taxonomies? 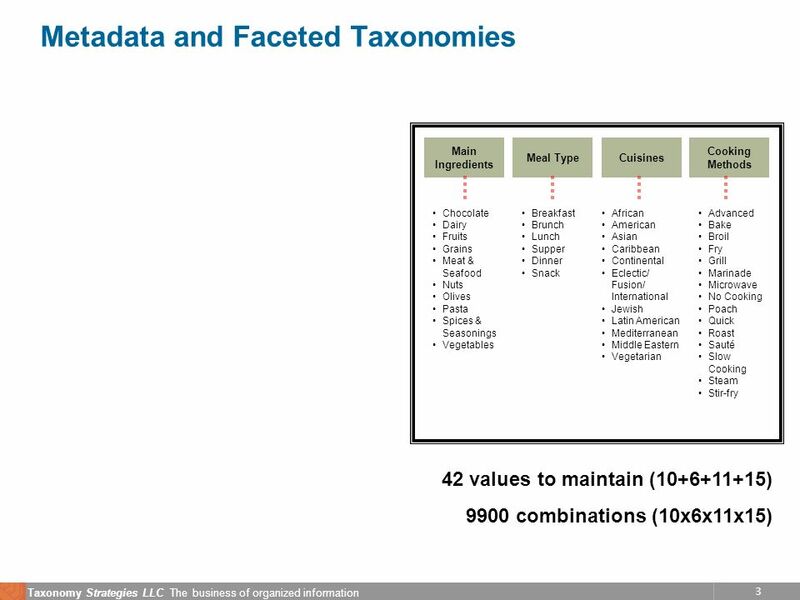 18 18 Taxonomy Strategies LLC The business of organized information Um, is someone managing all this? 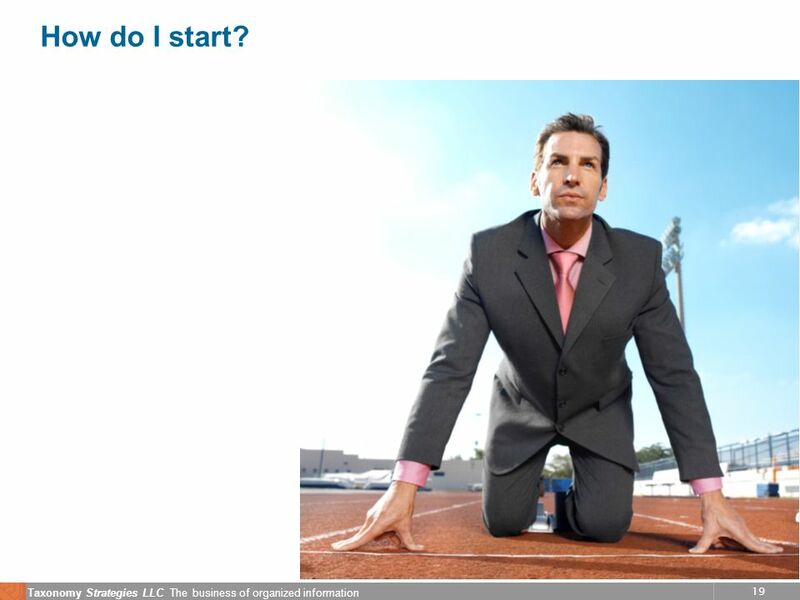 19 19 Taxonomy Strategies LLC The business of organized information How do I start? 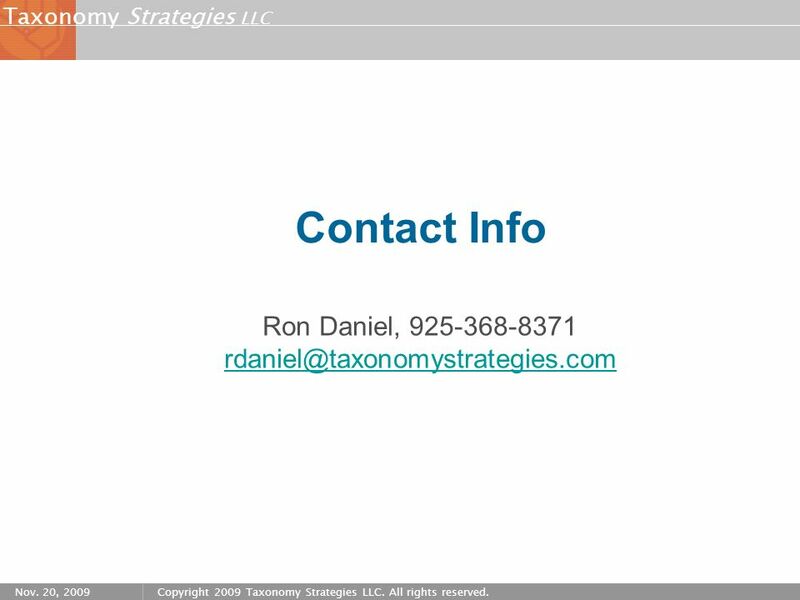 Download ppt "Strategies LLC Taxonomy Nov. 20, 2009Copyright 2009 Taxonomy Strategies LLC. All rights reserved. 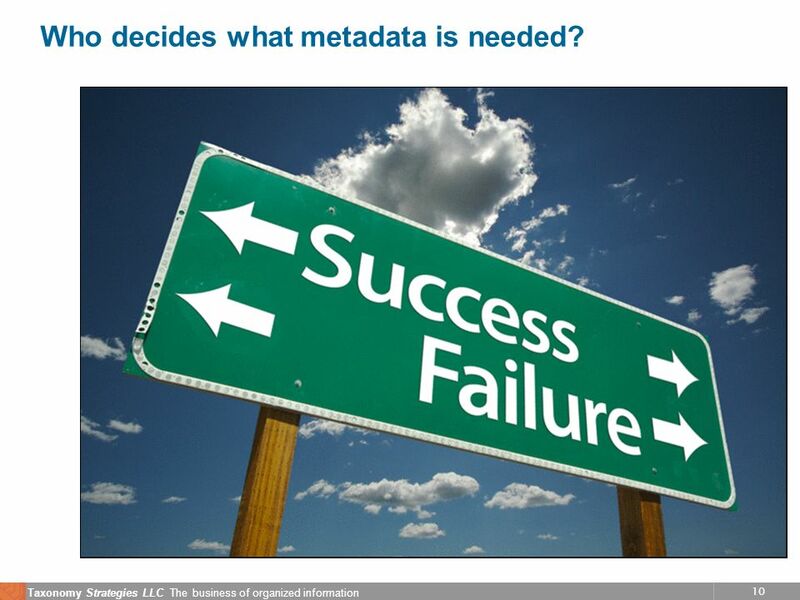 Metadata: Defining & Harnessing Ron Daniel, Jr. Principal,"
Strategies LLCTaxonomy May 22, 2006Copyright 2006 Taxonomy Strategies LLC. 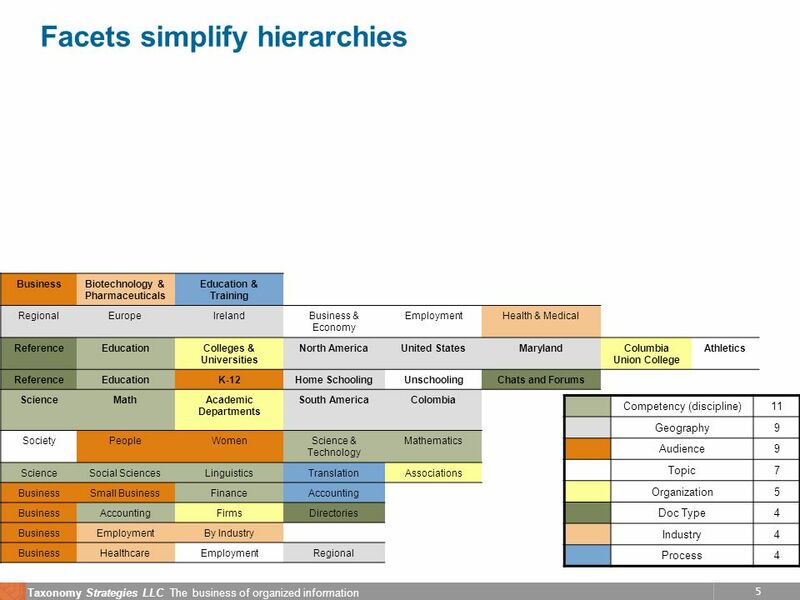 All rights reserved Enterprise Search Summit Taxonomy Fundamentals Workbook.